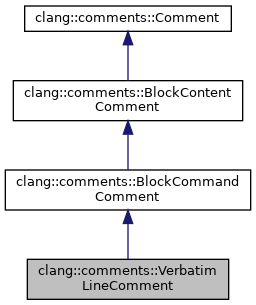 Verbatim line has an opening command, a single line of text (up to the newline after the opening command) and has no closing command. Definition at line 943 of file Comment.h. Definition at line 949 of file Comment.h. Definition at line 966 of file Comment.h. Definition at line 968 of file Comment.h. Definition at line 962 of file Comment.h. Definition at line 970 of file Comment.h. Definition at line 974 of file Comment.h. Definition at line 945 of file Comment.h. Definition at line 946 of file Comment.h.